I get a lot of offers for cannabis-related cookbooks for review, but I generally turn them down. While that particular herb is legal where I live, I've never been all that interested in cooking with it. To be honest, I probably still won't. But that doesn't mean I'm not curious about it. So this time around, I said, "Sure, send me the book." I figured that at worst, I'd be amused. 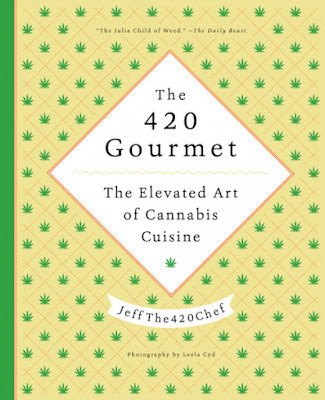 And since the book was from a legit publisher, I thought I might find some recipes I might make without the cannabis. The first part of the book delves into the different strains of pot you might use, how to make oils and butters, and how to calculate the amount of THC (the active ingredient in marijuana) that you might be ingesting. All good stuff to know. I pretty much skipped that and moved right to the recipes. These were not Cheeto-laden recipes, and they were pretty much made from scratch rather than using boxed and bagged and canned items. Potzo Ball Soup looked pretty good, as did the wild mushroom risotto. Whacky Mac and Cheese included both sharp cheddar and Emmenthaler cheeses and optional white truffle oil. Count me in. Of course there were desserts, like the Poundin' Amaretto Pound Cake and Heath Bar Canna-Cookie Butter Brownies. I mean, sheesh, that sounds good without the need for added herbs, right? The good thing is that if you want to make these recipes without the "high" it's pretty simple to substitute plain butter or oil for the infused ones. And if you live in a state where cannabis is legal, then you've got some solid recipes here, along with calculations to make sure you're ingesting a sensible amount. I have yet to try any of these recipes (with or without), but the ones I've looked at seem solid. No bizarre ratios or odd instructions. If you try any of 'em yourself, let me know. 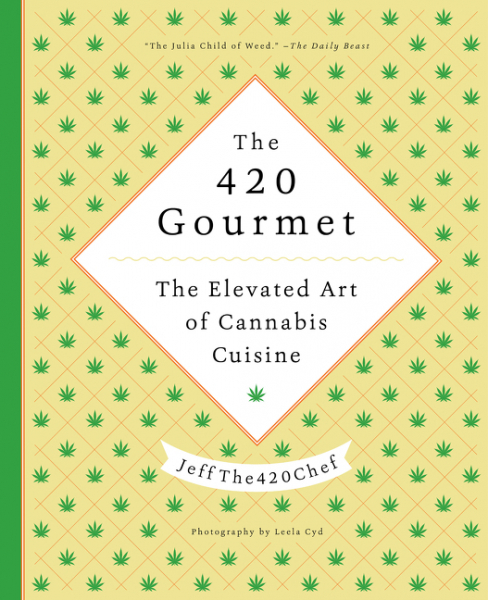 You can by the book at: HarperCollins | Amazon | Barnes & Noble and find the author at jeffthe420chef.com, Facebook, Twitter, and Instagram. I've seen a few pictures, and I agree, the recipes look good whether you want to use the secret ingredient or not! Totally ... although it's good to have the facts if I decide to do some fancy infusing!